Spring Valley High School resource officer Ben Field’s violent arrest of young black woman: Minority students receive much rougher discipline than their white peers. The incident at Spring Valley High School. The video is shocking. 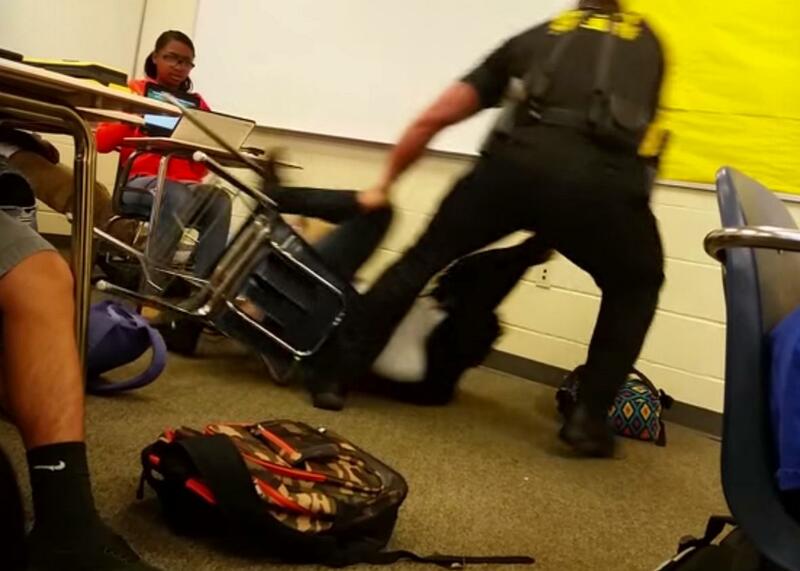 A young woman—a student at Spring Valley High School in Columbia, South Carolina—is sitting at her desk. A police officer stands over her. He asks her to leave, and she refuses. Suddenly, he tosses her back in her desk, picks her up, and drags her to the front of the classroom, where he arrests her. Her classmates are watching, and they give vital context. “She really hadn’t done anything wrong,” said one student, Tony Robinson Jr., who gave his account to a local news station. The girl was working on her laptop and took out her phone. The teacher asked for the phone, and she refused. “She said that she had took her phone out, but it was only for a quick second,” said Robinson. The teacher called in an administrator, who asked the young woman to leave. She wouldn’t. In turn, the administrator called the school’s “resource officer,” Ben Fields. It’s at this point that students start recording, and we see what happens next. After arresting the young woman, Fields threatens another student with the same. Fields, a sheriff’s deputy, has a troubled history in law enforcement. “In 2007,” reports the New York Times, “Carlos Martin and his wife, Tashiana Martin, sued Officer Fields, Sheriff Lott, and another deputy, Robert Clark, for violating their civil rights during a routine investigation of a noise complaint.” In the encounter, says the complaint, Fields slammed Carlos Martin to the ground, handcuffed him, kicked him, and emptied a can of pepper spray into his face. He also confiscated a cellphone that Tashiana Martin had used to record the event, handcuffed her, and threw her to the ground as well. The lawsuit went forward, but a jury eventually ruled in favor of the deputy. It’s easy to treat all of this as isolated behavior from an overly aggressive police officer and a teacher who couldn’t manage his classroom without outside authority. But the fact is that this incident—where police force, normally reserved for criminal offenders, was used to discipline a student—is incredibly common. Since 1995, juvenile incarceration has dropped by more than 40 percent. In the same time frame, however, out-of-school suspensions have increased 10 percent, doubling the total from 1970. As reporters Dara Lind and Libby Nelson explain for Vox, this stems from several trends. The crime waves of the 1980s and early 1990s sparked deep concern in schools across the country. In 1994, President Bill Clinton signed the Gun-Free Schools Act, which mandated specific penalties for carrying weapons in schools. Zero tolerance was national policy, and school districts devised their own codes meant to stop minor incidents before they blossomed into major ones, a public school analogue to the “broken windows” policies in places like New York City. What’s more, crime fears—as well as the mass shooting at Columbine High School in Colorado—led to more police officers in schools as well: The number of “school resource officers” increased 38 percent to more than 13,000 in 2007, up from 9,446 in 1997. As is often true, from the war on drugs to mass incarceration, the brunt of this punitive policy falls hardest on black and Latino Americans. From 1972 to 2010, the school suspension rate for whites in middle and high school climbed from 6 percent to 7.1 percent. For Latinos it climbed from 6.1 to 12 percent. For blacks it more than doubled from 11.8 percent to 24.3 percent. In 2007, 70 percent of in-school arrests were of black and Latino students. Overall, according to the U.S. Department of Education Office for Civil Rights, black students are suspended and expelled at a rate three times greater than white students, 16 percent versus 5 percent. This is true for all ages: “Black children,” notes the DOE, “represent 18 percent of preschool enrollment, but 48 percent of preschool children receiving more than one out-of-school suspension.” White students, by contrast, “represent 43 percent of preschool enrollment but 26 percent of preschool children receiving more than one out-of-school suspension.” Students of color with disabilities are also more likely to be restrained or suspended: Black students constitute 21 percent of all students with disabilities, but 44 percent of those subject to mechanical restraints. At all ages, black students are perceived as more dangerous and unruly. And to that point, at least one analysis shows that teachers hold lower expectations of black and Latino children compared with their white peers. When mixed with zero-tolerance discipline and school police officers, you have a recipe for wide disparities in treatment. A 2011 study of North Carolina schools from the National Education Policy Center found that 32 percent of black students were suspended for first-time offense of cellphone use at school, compared with just 15 percent of white students. For a first-time offense of public display of affection, almost 43 percent of accused black students were suspended, compared with about 15 percent of white students. This dovetails with similar research in other states. In schools as in life, black Americans are punished worse for the same offenses as their white peers. And the consequences are terrible: Suspended students are more likely to drop out of school, and suspensions increase the odds of arrest and juvenile detention. Here’s the truth: What happened at Spring Valley High wasn’t an exception or a scandal. It’s how things work for black students. And if you’re feeling cynical, it’s how they’re supposed to work, with segregated or predominantly black schools feeding the maw of our nearly insatiable prison system.